Central County Fire and Rescue (CCFR) has a rich history over more than a century. Since 1904, firefighters have committed themselves to District safety and to making this community a safe place to live and work. 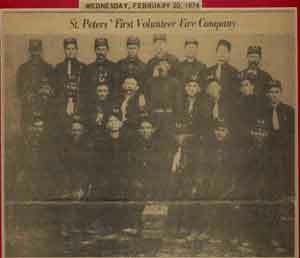 June 1904: The St. Peters Volunteer Fire Company, the first fire department in St. Peters, was founded when St. Peters’ population was about 200 people. The 24 Department volunteers worked out of a small wooden building and used a hand-pumped fire engine. 1921: Local businesses were asked to subscribe to the Fire Company for $1.00 per month, to help fund repairs and expenses. 1941: Wi th St. Peters’ population steady at about 250, the Department was incorporated as the St. Peters Community Fire Department. 1947: The St. Charles Township Volunteer Fire Department was founded by the St. Charles Chamber of Commerce and funded by $100 donations from 6 individuals, and later, a $500 donation from the County Court; the Chamber eventually promoted and helped organize departments at Orchard Farm, Portage des Sioux, Cottleville, and St. Charles. 1971: With St. Peters’ population now at 400-500, the Department petitioned the St. Charles County Court to allow an election to form a tax-supported fire protection district. The election was overwhelmingly approved, and the community now supported the Fire Department with its tax dollars. 1978: The St. Peters Department hired its first paid (part-time) employee: an assistant fire martial. 1979: The St. Peters Board of Directors authorized the position of a paid full-time Fire Chief. 1980: The St. Peters Department hired the first paid firefighters. 1980-1985: The population of St. Peters began growing by leaps and bounds, helping to make St. Charles County one of the fastest growing counties in Missouri and in the country. 1989: The St. Peters Department hired 6 additional firefighters, for a total of 21 firefighters. 1991: The St. Peters District, with 4 stations and 33 employees, served a population of 50,000 people over 52 square miles. 1996: The St. Charles Fire Protection District was still mostly a volunteer department, with only a full-time paid fire chief and part-time paid firefighters; their coverage was entirely volunteer-based from midnight to 8:00 AM. 1996: The City of St. Charles was annexing portions of the St. Charles Fire Protection District and projecting a budget deficit for the first time in their history. 1996: A group from the St. Charles and St. Peters Fire Protection Districts discussed the possibility of consolidation and determined that the citizens of both districts would benefit from one, consolidated department. 1996-1998: The two departments researched and planned the transition, determining great advantages, such as sharing financial resources, personnel, equipment, and purchasing, and eliminating duplicated services. April 1998: The communities in both Districts voted and approved the consolidation. Central County Fire and Rescue, CCFR, was born. April-July 1998: CCFR hired an additional 27 staff members and began building the District to its peak effectiveness and efficiency. 1998: CCFR was named the Missouri Fire Department of the Year. CCFR is now the largest fire department in St. Charles County, serving approximately 90,000 over 72 square miles. The District touches both the Mississippi and Missouri Rivers. There are currently more than 80 full time employees. The Department continues to grow and constantly strives to be proactive and innovative, working together with the community to keep everyone safe.